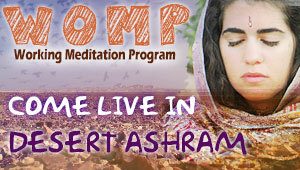 WOMP is a residential program in the Ashram, combining meditation, work and community life. The program is an invitation for people to experience communal life in a small community, and an opportunity for gaining awareness and personal growth. The activities are led and supported by a group leader, to whom you can address any and all issues. The program costs only 60 NIS per day. Besides guidance and support, the price includes full board as well as a bed in an air conditioned shared WOMP room. Minimum participation time in the program - 10 days, of which the first 3 days are "trial" days*. We recommend you spend at least two weeks in the WOMP. The human Mind asks: why such a long WOMP period in the middle of everything that's going on in my life? In the middle of the desert? Am I not too busy for this? To put the Mind at ease, we allow 3 days of trial and acclimation, by the end of which you can decide with the WOMP leader if you'd like to continue, or that meditating in the desert isn't your cup of Chai. The WOMP process is subsidized by Desert Ashram. We charge only the cost of a person's stay in the Ashram. Isn't it really nice of us? *If the first 3 days had passed and you decided that the WOMP is not for you, instead of WOMP price, you will be charged the regular Ashram Bamidbar accomodation price for the 3 "trial" days (of 220 NIS per night). The WOMP has a group leader. Please consult her regarding any issue at any time. She's there for you. Meditations are the trick here. A key part of the whole process is two meditation sessions a day. It's obligatory, and it's also a lot of fun and very rewarding. The third trick is participating in community work, four hours in the morning and two in the afternoon. Osho called it "Work as Meditation". We invite you to work in awareness, fun, communality, personal responsibility and creativity. We'll leave it to the WOMP leader to explain how to wash dishes in the kitchen with meditative awareness... or as WOMP participants like to say: "open your heart and close the kitchen". Respect each others' space. The WOMPers live together in a shared room – sensitivity is the name of the game here! A morning circle is held every morning after breakfast – please arrive on time. In the dining hall there is a duty-assignment board. Look for it and you might see your name up there. If you leave for a short break, please pack you possessions away from the bed and shelves, and leave them in a corner of the room. This is our request and also a good advice for you, trust us on this. During festivals in the Ashram, the WOMP goes on break. WOMP members are welcome to join the festival staff. During the weekends, there are workshops conducted in the Ashram. We invite you, if you'd like, to join them, and even though the workshops are our guests and not "Ashram productions", we arranged for special discount prices for you. (Discounts are available to WOMPers from their second weekend onwards). Everyone cleans the shared room together on Tuesday afternoon.